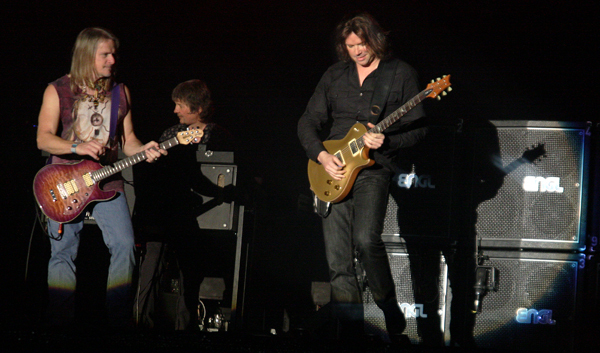 At Deep Purple’s show in Ystad, Sweden last, guitarist John Norum from Europe (who supported Purple) got onstage to jam on “Smoke on the Water”. 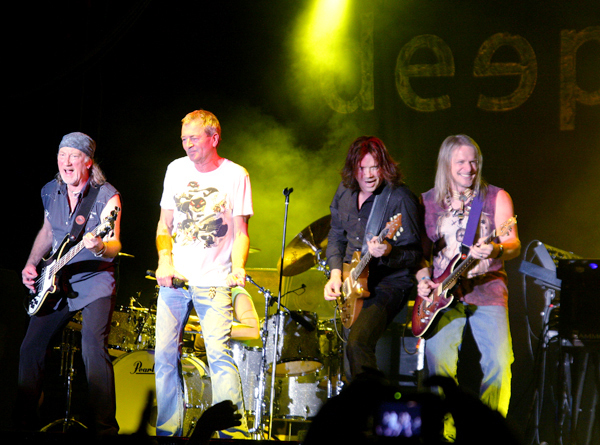 Steve Morse and John Norum preceded the song with a lengthy jam – with Ian Paice and Roger Glover looking on – before tearing into the Purple classic. Posted by Rasmus Heide on Sunday, August 10th, 2008, filed under 2008 Europe, News. You can follow comment on this post through the RSS 2.0 feed. You can leave a comment below, or trackback from your own site. that is great,two of the best guitarist Norum and Morse. Well, as many ones expected, Sometimes I Feel Like Screaming finally certainly ‘permanently’ made its way into the set list as this tour goes on. It’s absolutely classic and fan favorite, isn’t it? That’s a pity they(DP) did not realize that since the beginning of this tour. Agree? John Norum is a very talented underrated guitarist from my favorite band, Europe(beside DP of course). Remember solo from The Final Countdown? Uh, wish I could be there watching two of my guitar heroes in action. Oh God, it can’t be better in the real world!!! I have the cd FACE THE TRUTH perfomed by J.Norum with featuring Glenn Hughes on vocals: I like this work! great hard rock and nice beatifull melodies..
there other line up have been great but…..there’s only one purple line up for me. have listened to “blackmoors nights”they are great but…..just wish he would do one more tour with the original purple,just to complete their standing as one of the best rock bands of all time.